I guess that one out of two isn’t all that bad. But, my son would tell me that this is only actually 50 percent, which, when you put it THAT way, isn’t really all that good. Feh. I am admittedly terrible at many things. Laundry is one of them. I am the person who doesn’t separate whites and darks because I totally think it’s a myth. Judging by how gray the majority of my white camisoles are, I’m thinking that perhaps there’s some truth to this nasty rumor that whites and darks should be washed in different loads. I am the person who tries to use bleach to whiten said gray camisoles, but doesn’t really know how to use bleach and ends up with…gray camisoles. I am the person who loads the washer all the way to the very, very top to cut down on the amount of loads. I am the person who doesn’t pay attention to stains. I am the person who throws a lovely dry clean only dress/sweater/shirt/skirt into the washer and/or dryer and doesn’t realize until it’s Cabbage Patch Kid sized. Lucky Miss Emily has inherited many a piece of clothing because of my poor shrinking skills. I am the person who abuses dryer sheets. I am the person who shrinks all of her bras. I am the person who doesn’t believe in hanging anything to dry, because, well, there’s the whole crunchiness factor. I am the person who cannot iron anything to save her life. Well, that’s a lie. I can iron a mean melty bead creation. But a dress shirt? FORGETABOUTIT. I am best friends with my dry cleaner. I am the person who folds all of her laundry and puts it back into the hamper and lets it sit there for days and forces her kids to go hamper diving to find their (un-ironed) uniform shirts. I am the person who washes towels and pajamas too often. Plastic water bottle addiction is one of them. It’s shameful. But, you only make the mistake of taking a swig of a water bottle and catching a mouthful of chewed-up-by-Isabella cashews ONCE and you realize that an open water bottle is a horrific backwash disaster waiting to happen. Once it has been open, there’s no telling which child has gotten to it, so a new one gets opened. And, I mean, the convenience of them is just undeniable. Because as sure as I that my younglings will have to pee at the most inopportune time, I am just as sure that they will needadrinkrightthissecondormythroatisgoingotcloseup. Always. Stuck in traffic. In the carpool line. At the park. At Target. In the backyard. 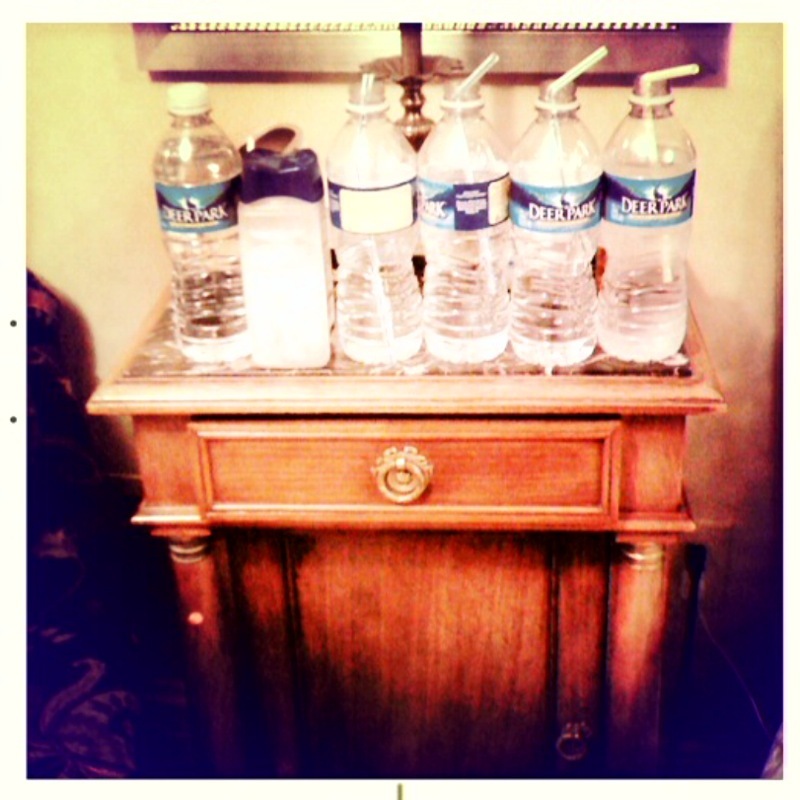 So, you know, I have tossed water bottles everywhere. In my purse, in my van, in my bedroom. Convenient. I took the three kids to Target and let them each pick a water bottle of their very own. I bought a water bottle for myself. And one for the husband. And the very best part about all of this is….yeah, yeah, it’s good for the environment and all that jazz….that I will never, ever run the risk of getting a mouthful of something that has been previously chewed. One out of two isn’t bad, right? « She is lucky that she knows how to cry on command. I am also horrific at laundry and agree with every comment you make – come on, you totally don’t need to separate colours! I have also discovered that you can wash handwash only clothes on the delicate setting in the washing machine – this is saving me a ton of time haha. I’m actually really good at laundry (five years of Catholic school – where I had to wash and iron my own uniform – followed by five years of co-op jobs where I needed to be presentable), but my wife takes care of it during the day while I’m at work. As for the water thing, we use those stainless straw cups from Thermos (although we’re getting new ones because the old ones have plastic bases that have come off due to too much dishwasher time). It’s not about one out of two, it’s about baby steps. My son’s first grade teacher recently asked me if I could iron some shirts they were going to use in a performance. I panicked for a moment because I could not remember if we even owned an iron. But then I remembered those melty beads that I have ironed many times recently. So I of course pretended I ironed all the time and took then shirts home and then handed them off to my husband to iron. Next year he said we are taking them to the dry cleaners like we do with everything else that needs ironing in our house. The crunchiness factor – so true! The only way to keep my jeans from shrinking to ankle-length is to hang them to dry. Then I have to iron the heck out of them to uncrunch them. The jeans have totally won. Congrats on your new water bottle policy! We use refillable bottles at our house now too. We have a couple of bottles for each of our daughters so that there’s always (okay, almost always) one that’s clean. We made the switch last summer to reusable bottles and we love it! What is this “iron” of which you speak? I am very impressed that you fold the laundry before putting it back in the hamper. I have the unfortunate situation of a guest bed room next door to the laundry room, the clothes happily stay in there when clean for us to go through. Suffice it to say my husband does not find this to be my best quality. I have too much laundry to even consider being “Good” with it. My main concern is to avoid avalanche. For each of my kids, I have a clear plastic crate and that’s where all of their clean washing goes. I iron it and put it away…very rarely! But they are welcome to! this is exactly how I handle laundry. How do you abuse dryer sheets? Do you touch them in their no-no spots? Yay! The California tree hugger in me is so excited! Especially since you don’t recycle in Atlanta! Also, I have to hang almost everything. Downy helps keep it not so crunchy. Also, I dry things for like 15 min and then hang the rest of the way. I have to, otherwise all my pants will be floods. If by iron you mean throw things in the dryer and hope the wrinkles come out, then I totally iron! Um yes. On most of the above. Last summer I went to REI and bought all of us expensive Sigg water bottles. So pretty and shiny. Or I think they are. I remember using them for a week and then I got tired of washing them and now? I have no idea where any of them are.